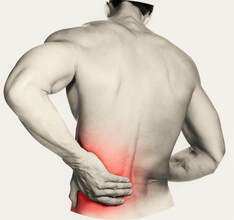 PLEASE NOTE: The following information is primarily focused on left lower back pain. However, these same principles can be applied for right side pain, by reversing the images and instructions below. There is much written on how to stretch, and from my experience most types of stretching are satisfactory if performed correctly. Nonetheless, I advocate holding a long sustained stretch. I feel in most circumstances this type of stretch will yield the best results, with less likelihood of exacerbating the painful area, and it is also less likely to be misunderstood by the patient. The picture to the left depicts a person who has pain in the left-lower-back. Therefore the following instructions are aimed at stretching the right side of your back, which in this case is in a short, contracted state. Causing your spinal vertebra to rotate to the left, and be painful on the left side. Naturally, if your sore lower back is to the right, just reverse all instructions to stretch the other side. The natural tendency is to stretch the sore muscle. 1. However the sore muscle is usually the already overstretched muscle. 2. An over stretched muscle is weak. 3. Stretching it further will weaken it further. 4. Stretch the opposing muscle. I have seen too many instances where a successful treatment that is followed by an adjustment period of some discomfort, is cause to fail because the person in question continues to stretch the sore muscle. Thereby halting the correction process, and bringing about the very weakness that cause the pain in the first instance. An important point in stretching is in taking the stretch to the point of mild discomfort. If there is no discomfort, there is no reason for the body to increase the length of the muscle. Conversely, if the strain of stretch is too strong, the stretch reflex will not allow movement into the relaxation phase. The stretch reflex is first and foremost a protective mechanism, designed to stop the stretch/action from damaging the joint. Imagine if there was no mechanism in place to protect our joints. Imagine if we threw a ball. The shoulder would dislocate and tear the muscles of the rotator cuff. Therefore a long sustained stretch of mild discomfort is aimed at increasing the length of the muscle without activating the stretch reflex. For more info on stretch reflex/Golgi tendon organ click here. IMPORTANT - if the feeling of stretch within the muscle does not seem to be releasing at the 15 second mark, then back-off slightly. It is imperative that the stretch reflex be re-trained to allow relaxation. If you have been tight in a certain area for months or years, it is unlikely the muscle will lengthen/relax successfully without treatment. This is due to pathology within the muscle, of which lack of blood flow, inflammation, trigger points and associated muscle-fibre adhesions are involved. CLICK HERE to learn more on Trigger Points. This stretch actually stretches many muscles, but for this example the focus is on the lower back muscles on the right. ​The stretch above is most likely too strong if you are in pain, or if your balance is lacking. If in doubt don't even try it without appropriate supervision from a qualified person. This stretch is not recommended if you are weak or in acute pain. However, it is a good self-massage for those who are sufficiently strong. Just sit on the roller, and leaning back onto your elbow, or shoulder, use your legs to push yourself back and forth on the roller. If you are constricted by time and able to perform one stretch only - this is the one! This stretch targets the lateral rotators of the hip, which include the Gluteus Maximus and the smaller stability rotators such as the Piriformis. Additionally, as you become more flexible and are able to draw the leg further across the body, the stretch will progress to include the lower back itself. Often while doing this stretch you will achieve a slight crack/pop in your back, which is fine. Generally, this small sound is a result of your muscles applying pressure on the vertebra, which should all move smoothly into the required position, and causing the release of gas. Any vertebra or facet joint that has a slight bind will release with an audible crack, as in cracking your knuckles. This is not a problem, the pop/crack sound is just a release of gas from between your joints; primarily nitrogen. If you have had an adjustment by your therapist (realigning the bones of your lower back or pelvis) there is a tendency for the muscles to return to their previous position. This is undesirable, given that it was inappropriate muscle length that caused your back to 'go-out' in the first instance. Do not listen to anyone that tells you that the joint needs constant manipulation......The vertebra is not capable of moving (going-out) by its own violation. Since we now know that the vertebra are not in command of their actions, but rather at the command of other forces, it is time to look at what other forces may be involved. Under normal circumstances the vertebra only moves secondary to muscle contraction. Additional forces apart from your muscles may be a football injury, a car accident or spinal manipulation. Remedial therapy , stretching & strengthening will fix/alleviate most muscle aches and pain in the body.